Cover picture: I much admired a plant labelled Micropuntia pulchella exhibited by John Betteley at the Oxford Show in 2006. When my path crossed this dwarf species in Nevada I brought back cuttings of several clones. Some rooted and some rotted, (the way they do), but the picture shows one of the successes. Some also grow caudexes. It is too early to tell with mine but the the flowers are very nice! Click the image for a better one and more information. Welcome to this issue of Northants News - the cactus one that is. After the coldest December ever and the mildest, driest Spring for yonks, we have had locally the driest summer for years. Not so we hear for the rest of the country but all the rain they had seems to have shed before the clouds arrived in NN country. Played chaos with the FL’s vegetables! Then the Indian summer extended through September and October. Saved a packet on the heating, oh, and in the greenhouse too. 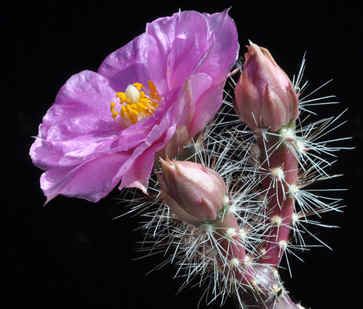 Another spin-off lies in the range of succulents that flower in winter but never manage to open their flowers. Mammillaria hernandezii and Lithops optica look a treat. Let's hope this keeps up. The editorial board here does not like cold, and neither does the cat, she says. Qualified and aspirant judges at the Judges’ Course were presented with a class for cristate cacti to judge in the qualifying ‘test’. No problem, some (and I) thought. A crest of Obregonia denegrii had ‘first’ written all over it on the basis of condition, maturity, presentation and rarity. What about freedom from pests and diseases? There are three points (out of twenty) available there. Ah, now here was the problem. In the second half of the test there was an audible gasp and the words ‘mealy bugs’ were heard over the studious (relative) silence. Turned out that an exhibit, and in particular the cristate Obregonia had some mealy bugs on it. Now I am choosing my words very carefully; those who noticed them claimed the plant was ‘crawling with them’ and those who hadn’t, claimed ‘a minor infestation’. Those of a pedantic nature would claim that any two mealy bugs moving would constitute the plural ‘crawling with mealy bugs’ and likewise two mealy bugs would be a ‘minor infestation’. The controversy at the Judges’ Course was because potential judges might qualify or not on the decision of the Show’s Committee but an infestation of pests does have a relevance at ordinary shows. A combination of the car journey and the warm humid show hall seems to wake the little bug…s up and they march up from their nests at the base of the plant to be more visible on the stems. Over the years I have had some mealy bug outbreaks and a major infestation on my Rebutia group actually killed some plants, which was a surprise. Routine sprays with Imidacloprid (Pravado) and other systemic insecticides work wonders and I haven’t actually seen a mealy bug on my plants for some years. However I am sure there is some neglected plant somewhere with an egg or two waiting to hatch, crawl up the nearest show plant, and embarrass me. Remember that insecticides may adversely affect some plants and this seems to be especially noticeable in the Crassula family. I put the rapid death of an Aeonium down to a drench of Malathion; Pravado can cause loss of farina or the waxy bloom on Echeverias and sometimes distortion of the rosettes. I take the attitude that it is better to be sure the collection is free from bugs and if affected the damage grows out in a month or two. However to treat valuable plants it may be better just to water the compost. I am not, of course, talking of the remote areas of the United States or South Africa I sometimes visit. Much nearer home; the nether regions of my greenhouse. September was manic and when I had some time to myself in October it was time to start the big sort out. Badly wounded plants, especially large cacti, will never recover and I made the trip to the green recycle bin several times. Then I plucked up courage and started on the ‘wilderness’. I have increased all the staging space to the maximum which greatly increases growing space. Payback is the wilderness areas at the far back corners only reached by taking glass out or shuffling the plants in front. I moved the plants in front. Here I found rampant creeping Crassulas which had jumped pots. For some reason they grow much better in the pot next door. Shame about the dead resident. Adromischus plants self-set from leaves, Dudleyas self-sown from seeds, rare Tylecodons springing from snapped twigs, (they are tougher than you think), this was a wilderness full of surprises. There were ‘dormant’ plants there, some had not grown for years. Tipping them from their pots some were sopping wet and rootless, some were dust dry. Even school kids are taught that all plants need water to grow. Question is; why were the wet pots and the dry ones side by side? However the symptoms were the same; no growth. Brittle labels snapped happily to fragments. I reassembled them on the kitchen table and wrote some more. Some were unreadable. I will give you a tip; pencil on plastic will still be readable after 10 years, even the best marker pens probably will not. I will give you another tip; the ink often etches the plastic and if you get the angle of the light just right you can still read the name. Some of the plants had no label at all. There were two attractive Haworthias of the retuse kind, the same species but neither pot had a label. I remembered that it had come as a single head from Graham Charles who had broken up a large plant. I grew a large plant, then broke it up and potted the heads. Now I had two large plants but no name. I reached for my Bayer (‘Haworthia Revisited’, my standard reference). Thumbing through the pictures reminded me the plant was Haworthia emelyae var multifolia. More a prolifera it was and thrives on neglect. Pity about the other Haworthias I like, they lose their roots first, then their will to live. Another ‘lostalabelii’ was Senecio talinoides I knew, but which variety? There are fivish but an hour with Rowley’s Senecio book, the IHBSP Dicots volume and the internet still left me puzzled. I put it down to cylindrica because this seemed to be the commonest in cultivation and an internet picture showed the same blue leaves. The rampant creeping Crassula was C. ‘Justus Corderoy’ and I started a new plant afresh. Best practise with these cushion plants is to keep repotting them so there is a clear space round the rim. However unless you want a show plant, (and ‘Justus’ is hardly one), five inches is big enough for anyone. I resolved to never neglect the wilderness for so long in future. The strange thing is that despite throwing away quite a few plants and repotting many into the same or smaller pots the plants didn’t fit back into the same space they had come from. Weird! The form from the postman said I could collect an undelivered parcel from the local post office. With a bit of thought I remembered that I had ordered a book. Burning rubber I shot off round the corner to collect it. Frenzied hands easily pulled the 'rip-cord' on the packaging, then utter frustration as the inner plastic shrink-wrap defied my fingernails. Eventually the plastic gave way when I resorted to scissors. Kew's new Aloe book fell onto my lap. I took a great gulp from the heady aroma of fresh printer's ink, I just love the smell of new books. Well, musty old books are pretty good as well. The book purports to describe all the species of Aloe in the World and it seemed pretty comprehensive with several pictures of each. It is organised like Smith's 'Aloes of South Africa' - Tree Aloes, Grass Aloes, Spotted Aloes etc, an arbitrary way that works well. I did wonder why the species were not in alphabetical order in their sections but this is a botanist's thing; one day our Colin will explain it. One use of the book is to identify those species which will make good plants to cultivate in our greenhouses. Many will be too big and some just too ugly. At first glance a few pictures appeared to be upside down but reading the text these species are procumbent in habitat and again not good subjects for culture. I have often been quite scathing of grass Aloes, but was surprised to see that in this section there were several desirable plants, or rather they have large attractive flowers. Floppy grassy foliage is always going to be just that. If you think that this will be the last word on Aloes I am afraid that the descriptions of new species don’t stop when the definitive book is printed. However the chances are that you will find all the species you grow, and all you might want to grow, in this tome. Well, at least for a while. So, will it fit your bookcase? It is 22mm wide. Fat, but there must be room, you could always send Pilbeam's Mammillaria book to the charity shop! Just joking, John. This is a bit of a Gordon Rowley special. Roland has penned us an account of Gordon's 90th and I was lucky enough to get an invite to ‘Cactusville’. Enjoy!